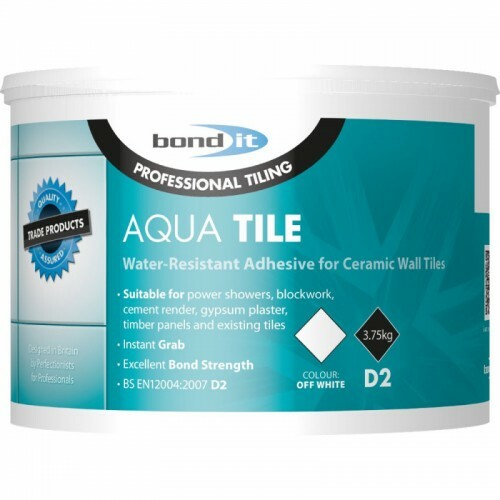 An off-white, ready mixed, shower-resistant, instant grab tile adhesive that can be used as an all round interior grade ceramic wall tile adhesive. Has an excellent bond strength and good coverage rates. CE Approved: Conforms to EN 12004 Type D2. Suitable for use in domestic power showers, kitchens, and shower areas. It embodies unique 'non-slip' properties but allows for adjustment while fixing. Note: It is unsuitable for swimming pools or other areas subject to total immersion. Not suitable for use with large format tiles, we recommend using a cement based adhesive for these applications.